In Part II of my three-part Becoming a Horse(wo)man Series below, I’ve shared what that meant, and what it continues to mean in my own life and that of every horse I touch! When I say I “turned him loose,” I mean that I focused on developing him at liberty. 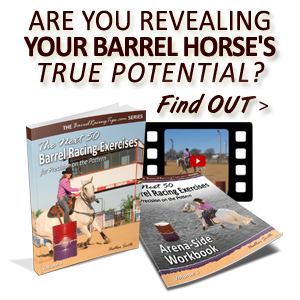 Now before you go scratching your head, know that what may appear to have nothing to do with barrel racing, just might have EVERYTHING to do with barrel racing, and anything we could possibly dream of doing with horses. To be “at liberty,” essentially means that the horse is at liberty to leave at any time – with no reins, lines or tack to stop them. As it turned out, this was a challenging area for both of us. In fact, I was having serious doubts just before one major breakthrough resulted in finally mastering flying lead changes – the epitome of my goals for us. I will say that working at liberty and even riding bridleless had always intrigued me. I’ve always felt as though doing so really spoke for the horse/rider relationship. Having enjoyed working colts free in the round pen, I was naturally drawn to learning more (and admittedly a little over-confident). Accomplishing my goals with Dot Com at liberty ended up being one of the most challenging (and rewarding) things he OR I could ever do. As a finished pro-level head horse, Dot Com came to us in need of some mental/emotional balancing. Even as a reserve world champion team roper with very quiet hands and great concern for his equine partners, my husband struggled with him in the box. However, our intention was not to just “get by,” but really acknowledge his issues for what they were – and completely work through them. If you’ve been following BarrelRacingTips.com for a while, you may already be familiar with Dot Com’s impulsion and anxiety issues, as they have been the subject of several articles on creating relaxation and quality movement. In this article, I’m excited to share more about what’s involved with working at liberty, why it’s beneficial to both horse and rider, as well as details about my humbling mistakes, our victories, and what we learned along the way. Understanding the benefits and purpose of working at liberty starts with understanding that horses very naturally seek connection. In nature, their survival depends on it. A herd of horses behave similarly to a school of fish – there is comfort and safety in groups. To mirror the feelings and actions of their herd members is part of how horses are wired. When they aren’t feeling threatened, it’s very natural for them to show interest in connecting with humans. Horses communicate with each other through body language – we can learn to read them and communicate better with them (even in the saddle) by paying close attention to how they position their bodies, right down to the intricacies of their facial expressions. The better we learn to “speak horse,” the better we’ll be able to do EVERYTHING with horses – including (and especially) barrel racing! One of the most natural ways to “speak their language” and communicate with them is on the ground – just as another horse would. 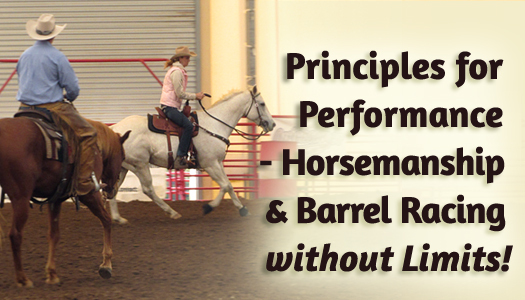 It’s a great place to build and refine the foundation that carries over under saddle. My intention for developing Dot Com at liberty was not only to deepen my own horsemanship skills. 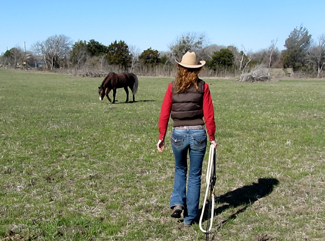 I also figured that if I could create calm connection and responsiveness without any lines, ropes, reins or tack in a wide open pasture, then perhaps it would help him in becoming more mentally centered in general – especially when we did have the support of such tools. In addition, I firmly believe that any type of cross training is beneficial to the speed event horse, but especially one like Dot Com. Before I go much further, in order to bust any potential misconceptions, I’ll say that when it comes to liberty (or anything we do with our horses), that there is a difference between operating with feel and having your horse just respond to a cue. In all reality, we really need both. 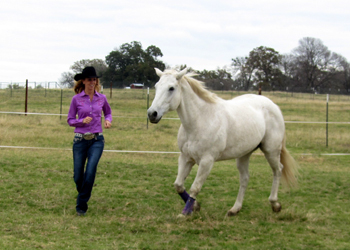 Without feel, you have a trick horse – a horse that may be able to do some neat looking, fancy stuff, however without a true connection there will always be something lacking. For example, there is likely to be a slight delay in response at times, or a horse might start offering what he’s been trained to do, whether he’s really been asked for that or not – in other words, take over. 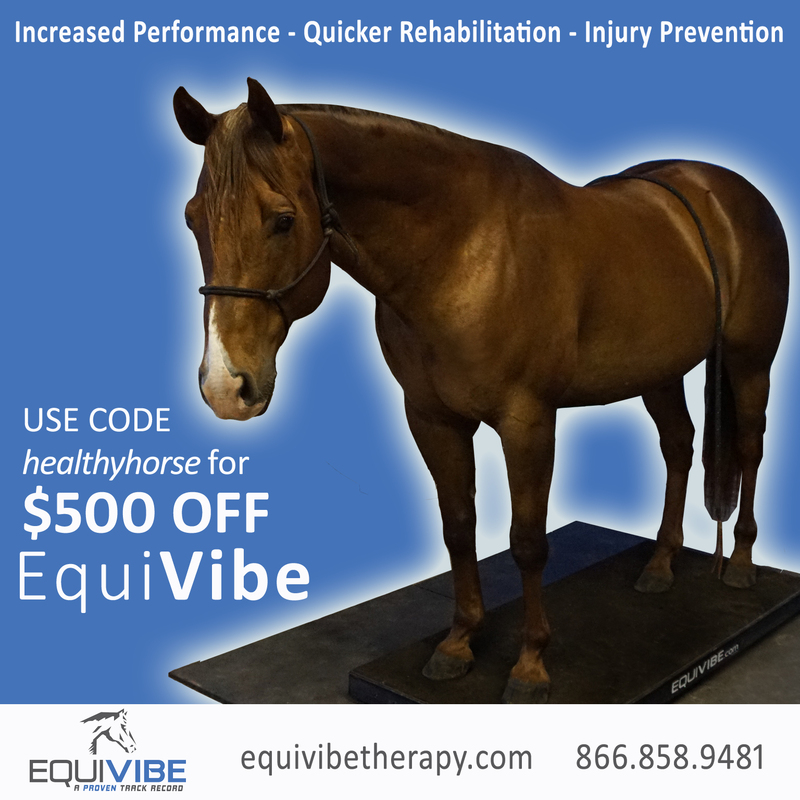 If you have feel, but no education, a horse won’t really build up the movement patterns and physical and mental conditioning to perform certain maneuvers with complete confidence, power, ease and athleticism. One reason why I’m not automatically impressed with any ol’ demonstration of bridleless riding or liberty is that a lot of it portrays an illusion of feel. It’s possible to have a “circus horse” operate and respond with FEEL, and a highly developed western performance “trick horse” that doesn’t. 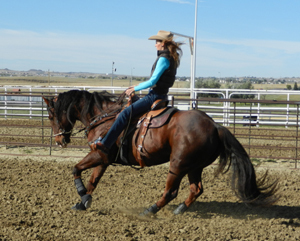 It’s easier and more common than you might expect, even for barrel racers, to fall toward the “trick horse” extreme. When we do this, we’re barking orders at our horses more so than having a two way conversation. There is so much more to horse training, than “horse training!” It’s not so much WHAT we’re doing with our horse, but HOW. It can all look very similar, and there can be a fine line between the two at times, but with feel, you have a horse that is connected to you and willing and able to move anywhere you ask, at any time because you’re engaging in a real-time two conversation, you’ve built a language rather than having a mechanically “trained” horse waiting for a certain cue. With feel, there is greater opportunity for harmony and unity, with harmony and unity there is greater opportunity for precision at speed. A genuine, intense and foundational love of horses is what inspires me, not just to be a top barrel racer, but a true horseman. It’s a fascination that borders the edge of obsession – and I wouldn’t have it any other way! Figuring out how both human AND horse can come together and truly WIN (in the barrel racing arena especially), is my passion. So you can imagine my disappointment, when after taking six months off from riding to bring Secrets to Barrel Racing Success to life in 2012, just months after it’s launch, and days before my gelding and I were scheduled to return to competition, he came up mysteriously lame. Little did I know then, that such an adverse circumstance would lead me on one of the greatest personal development journeys of my life. I often refer to 2013 as the year I took my barrel horse through physical rehabilitation, and my husband’s rope horse through mental rehabilitation. I didn’t expect either to take nearly as long, but then there were a lot of unexpected surprises along the way! 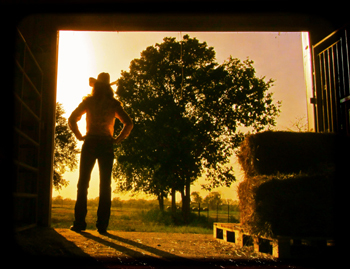 In my never-ending quest for becoming an all-around excellent horseman, outside of barrel racing I’ve enjoyed experiences that range from showing hunt seat equitation, to starting colts, creating positive breakthroughs for troubled horses, achieving success in reining, and more. I should add however, that just doing all these things doesn’t mean a rider is on a path to becoming a true horseman, in fact, far from it. I believe the importance is in how you go about it, the things you learn, the way you grow and change, and who you become as a result. Listen to this article in audio form! It’s #21 on the Barrel Racing Tips podcast. Have you heard that many young couples put more time & effort into planning their wedding, than planning their marriage? It’s a shame to think that happens, but a lot of people also put more time & effort into planning their New Year’s Eve celebrations than they do planning their New Year. Just like any great barrel run requires a good start in the alley – when we prepare ourselves with a great beginning, we set ourselves up for success in everything we do. No matter what time of year (or month, or day) it is, don’t underestimate the power of planning for success! 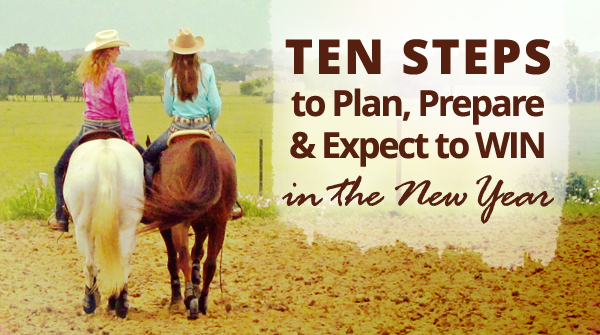 The ten tips below were developed to help catapult you toward your wildest barrel racing dreams in the new year. My wish is that 12 months from now, you’ll look back and realize you’ve gone above and beyond! 1. Look in the Rearview – A big part (and the first part) of planning a successful new year comes in reflecting on the past year. This is a great way to realize what’s working, what’s not, AND start thinking about what to do about it! https://www.barrelracingtips.com/wp-content/uploads/2018/06/barrelracingtips.png 0 0 Heather Smith https://www.barrelracingtips.com/wp-content/uploads/2018/06/barrelracingtips.png Heather Smith2013-12-31 05:00:092019-02-03 19:49:33TEN Steps to Plan, Prepare & Expect to WIN in the New Year! Listen to this article in audio form! It’s #11 on the Barrel Racing Tips podcast. It’s what every little barrel racing girl dreams of – blasting down the alley of the Thomas & Mack, laying down record-setting runs with thousands of fans screaming, then standing on the stage and taking home the gold. However, what competing at the NFR might look like from the stands, and what’s really necessary to make that dream reality, are two very different things. 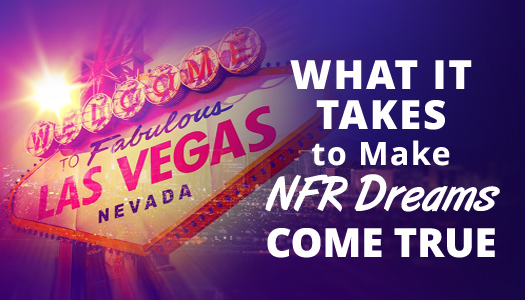 If you’ve ever been to the NFR to watch in person, it may have even fanned the flames of your burning desire to be competing there one day even more. It’s no wonder – a prestigious event like the National Finals Rodeo adds even more glamour and excitement to a sport so many of us are already smitten with. If you haven’t already embarked down the pro rodeo trail, then what you don’t see or experience are the hardships and challenges – the highest of highs followed by the lowest of lows, the many miles, the sleep deprivation, the horse, parking, weather, and vehicle problems, etc., etc. 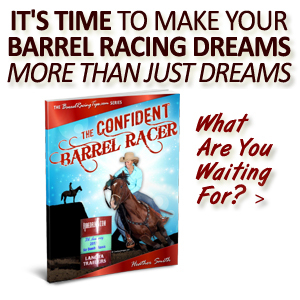 It all makes the actual barrel racing part look easy, BUT you already know that part is indeed NOT easy either. Below I’ve included their answers, as well as a deeper look at what I personally feel is necessary to make a trip down the alley at the Thomas & Mack. Again, not that I can speak from actual experience, although I’ve been fortunate to spend a considerable amount of time competing with, riding with and learning from numerous World Champions and NFR qualifiers, and one can’t help but connect a few dots and draw some conclusions in the process. In my mind, there isn’t a group of equestrian disciplines that the principles of natural horsemanship apply to better, than those of timed-speed events. They are THE ultimate test of horse and rider! When a person really dives into, studies and understands these principles, deciding to put the ideas into practice becomes a no brainer. While nothing we do with horses is technically ‘natural,’ it just makes sense to work with their instincts vs. against them if we want to train and compete with these animals as harmoniously as possible. What natural horsemanship offers, is an opportunity to learn and develop ourselves – both what we must understand in a mental sense, and the habits we must acquire physically, so we can really understand, and then optimize our horses. When we’re able to bring out their best potential in this way, we’re essentially putting the odds more in our favor to be successful in competition! We must do our part to inspire the horse to stay with us mentally and physically, take responsibility for moving with quality without being micromanaged, and even responsibility for managing their own emotions (at high speeds and under the stress of hauling and competition, no less). 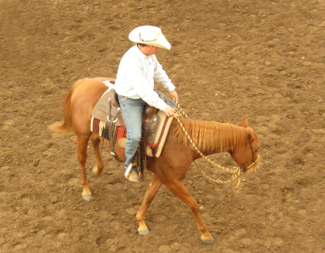 Horsemanship instructor and clinician, Matthew Bohman helped a handful of students and I do just that. Although I stepped in as a part-time teacher at the Principles for Performance clinic, my dedication to never-ending self-development had me also playing the role of student. https://www.barrelracingtips.com/wp-content/uploads/2018/06/barrelracingtips.png 0 0 Heather Smith https://www.barrelracingtips.com/wp-content/uploads/2018/06/barrelracingtips.png Heather Smith2013-11-19 01:00:222018-09-09 01:00:52Principles for Performance – Horsemanship and Barrel Racing without Limits! Listen to this article in audio form! It’s #43 on the Barrel Racing Tips podcast. 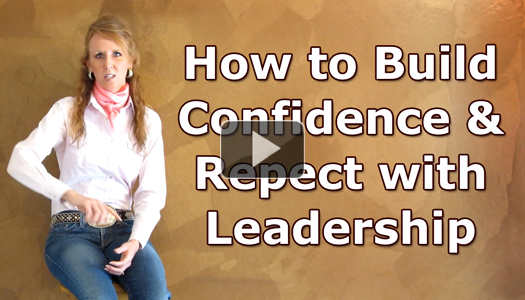 In this final part of a three part series of Q&A videos, I’ll be sharing what it really means to provide proper leadership, and how doing so can create not only happier, but more competitive barrel horses. “Naughty?” Or lack of education and leadership? But really, if you become very aware and look closely – does he ever volunteer to walk off before you ask? Or is there ever even a split second of hesitation present when you ask him to go? If so, regardless of whether the symptoms are very subtle, lack of leadership can be holding you back in competition. In every herd of horses, there is a leader, usually a boss mare that leads the other herd members. When you are with your horse, YOU are the leader, even if your herd consists of only you and your horse. It’s up to US to watch out for danger, protect our horse and help them feel OK about their surroundings so they can be calm, connected to us, and responsive. Listen to this article in audio form! 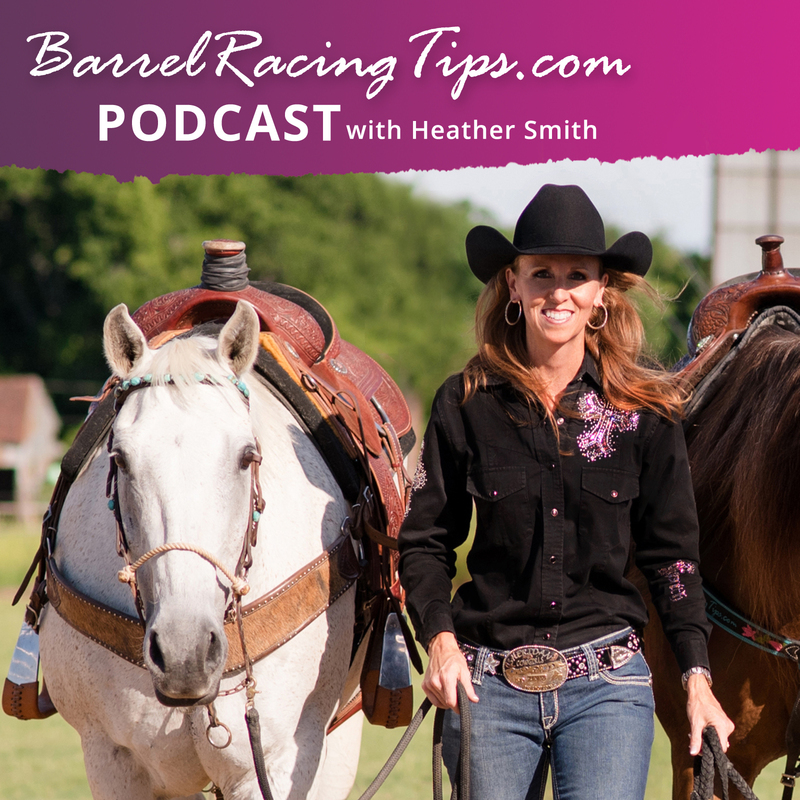 It’s #44 on the Barrel Racing Tips podcast. 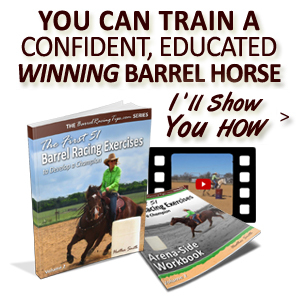 You may already be well aware of how important the start of any barrel racing run is. 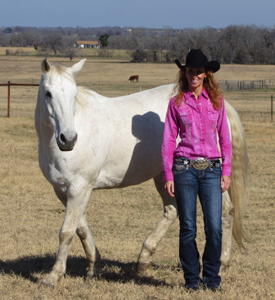 When I interviewed World Champion barrel racer, Mary Walker she explained that the reason for her tipped second barrel in the fourth round of the 2012 National Finals Rodeo was a positioning issue – in the alley. You read right. She felt as though Latte tipped the SECOND barrel, because of a positioning problem in the alley. But what if your success in a run, or a ride, started EVEN before that. What IF it started before you even laid eyes on your horse? 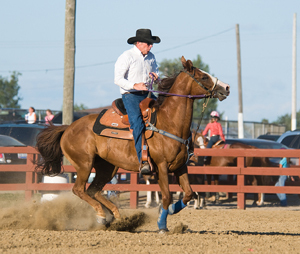 In the height of the competitive barrel racing season especially, I know that if I’m not very intentional and specific about planning my rides in advance, I’m less likely to stay on track. Sometimes, when the busyness of life gets the best of us, planning might take place after we’re already on the way to the barn, but rarely do I throw a leg over my horse without first giving thought to my intentions for each ride and what I am aiming to achieve in the long run. Your ride starts well before you lay eyes on your horse. At the same time, if we become too strict with our plans, we risk getting out of touch with how our horses feel and what they need in the moment. This is so critically important, because let’s face it – than can change from one day or one minute to the next! We may find that we need to focus on something entirely different than what we planned on. In these cases, it’s best to be flexible and allow our horses to guide us. Once you’ve made some notes (even mental notes) of your intentions for your ride, your second opportunity to set yourself up for success comes when you set foot toward your horse to halter him. Notice I said “halter,” and not “catch” (there is a BIG difference)! 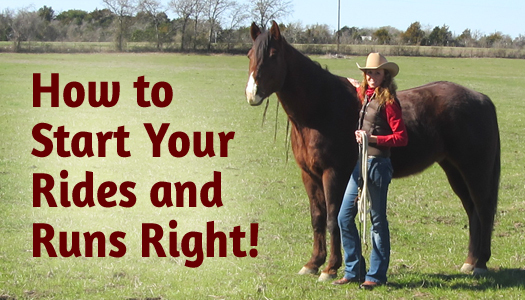 Think of it this way – you want to “catch” your horse’s ATTENTION, then halter your horse. https://www.barrelracingtips.com/wp-content/uploads/2018/06/barrelracingtips.png 0 0 Heather Smith https://www.barrelracingtips.com/wp-content/uploads/2018/06/barrelracingtips.png Heather Smith2013-02-19 01:00:452019-03-06 20:37:02How to Start Your Rides and Runs Right! So often as barrel racers we’re searching for something new… something we haven’t heard before, something we don’t already know. Truth be told, it was AFTER I had achieved a fair amount of success, and been a longtime practicing student of horsemanship and had even taken numerous young horses from unridden to reining horse-broke, that I feel my journey just began. 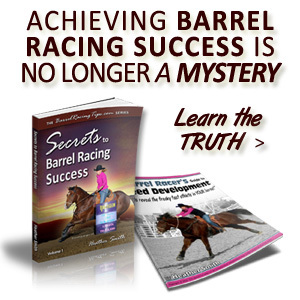 Dissolving the blocks that took my barrel racing to a whole new level meant taking an even closer look at the basics – MY BASICS and MY HORSE’S BASICS. It was greater awareness, subtle changes, and consciously retraining myself in the little things that lead to the most radical shifts. From first ride to first slide – good horsemanship has no end. Honestly, although I’ve always been obsessed with learning, there was a time a few years ago when I pretty much thought I had the whole package, but my eyes were finally opened to all that I had overlooked. When we’re looking for “something new,” or “something we haven’t already heard,” what we often really need, is to peel back the layers on that which we already know – to go deeper and our challenges with new eyes. Even if we’ve achieved some success or have been riding all our life, it’s likely that we’ve only just scratched the surface of our (and our horse’s) potential! BarrelRacingTips.com is about going under the surface, but what I share will only serve you IF you possess an open mind and an already existing willingness to do so.